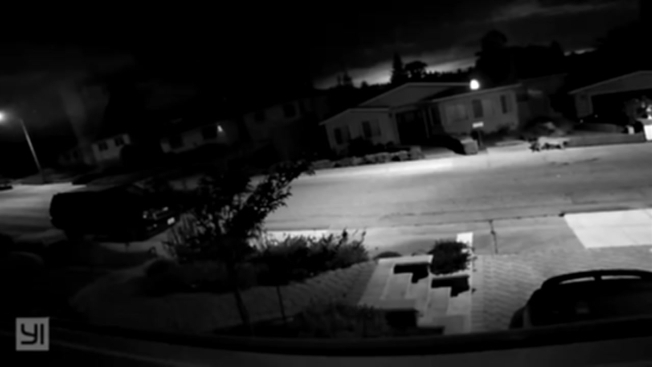 Home surveillance video shows a mountain lion strolling through a San Mateo neigborhood on Monday, Sept. 17, 2018. Another mountain lion has been spotted in a San Mateo neighborhood, police said. The latest sighting was reported around 2 a.m. Monday in the area of 37th Avenue and Alameda de las Pulgas. Home surveillance video shows what appears to be an adult mountain lion walking through the residential neighborhood. Monday's incident follows several other mountain lion sightings in San Mateo this year. On Aug. 14, a small mountain lion was spotted in the area of Fernwood Street. On Aug. 7, a mountain lion was caught on camera prowling in a backyard on Hobart Avenue. On July 16, an 80-poung mountain lion was tranquilized after being spotted in the backyard of a home on Virginia Avenue. On April 19, a mountain lion was spotted near two schools in San Mateo. Do not feed deer. It is illegal in California and it will attract mountain lions. If you see a mountain lion DO NOT APPROACH IT, especially one that is feeding or with offspring. Most mountain lions will try to avoid confrontation. Avoid hiking or jogging through wooded areas when mountain lions are most active—dawn, dusk, or at night. Keep a close watch on small children when hiking or traveling in or near wooded areas.